Busy busy weekend! The weather here in Tricities was AMAZING this weekend. 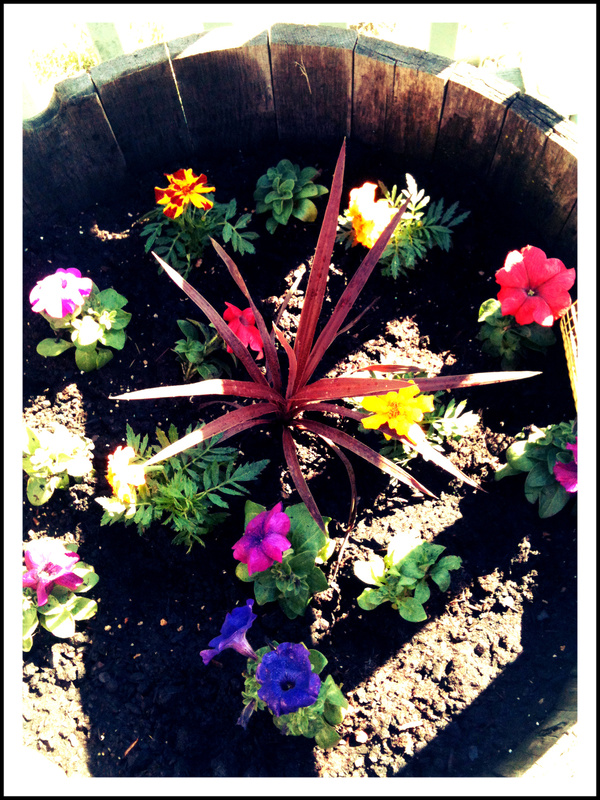 Felt like summer! I had to get outside and enjoy it. Friday evening Emma and I met up with my friend Tasha and her hubs, her brother and his wife, and their two adorable boys for some Pizza and then the Shrine Circus. I haven’t been to a circus since…..I can’t even remember when it was. All I know is I was little, it was the Ringling Bros. and Barnam & Bailey Circus, and there were motorcycles that rode in this giant metal sphere thingy SUPER fast without hitting each other. I’m not sure why that’s my only memory of it though. Seems odd. Anyway, the circus was fun; those people do some amazing stuff. They were giving Elephant rides to the kids before the circus started, so my little girl climbed up on the GIANT pachyderm and rode like a pro! I was skeptical if she would really do it, after her hesitation at going on the ferris wheel at the Carnival a couple weeks ago (although once she went on it, she didn’t want to stop). 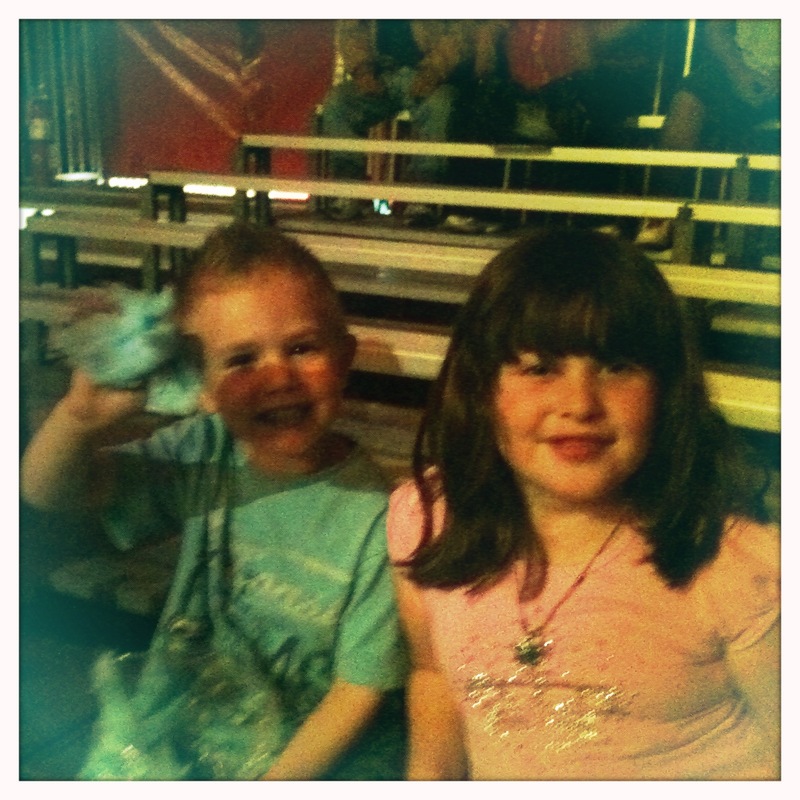 I just remembered I never posted about our time at the Carnival. I know you are absolutely just DYING to hear about it (haha). 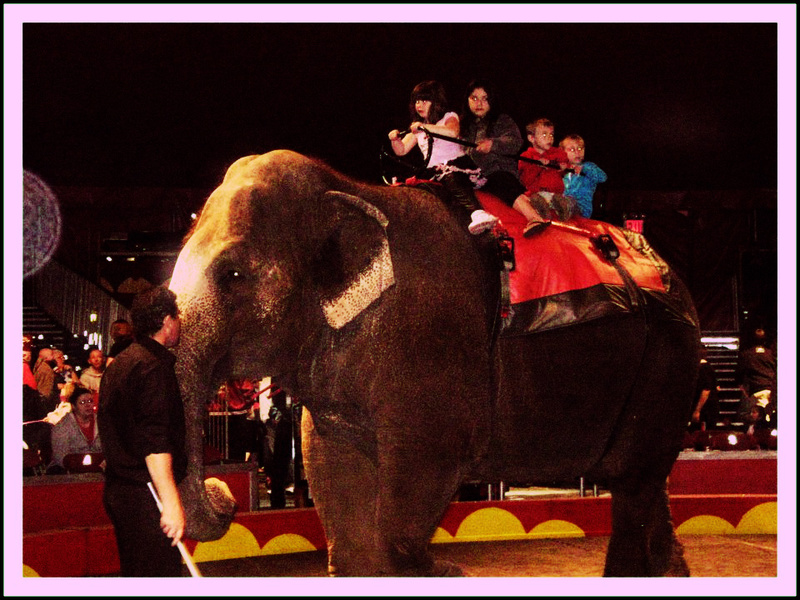 Ok, back to the circus….Here is Emma on the elephant, right up front…. Saturday was another beautiful day. 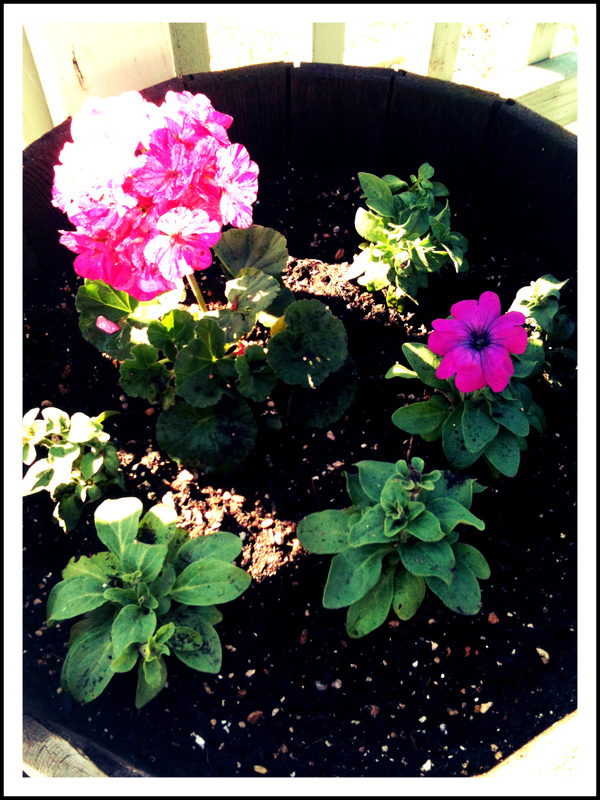 I absolutely HAD to get outside and enjoy, so Emma and I went to Lowe’s to get flowers to plant on the deck. Emma found a little inch worm on one of the plants as we were walking around, so that became her “pet” for the duration of our shopping. She carried it around, tried to feed it leaves from different flowers, talked to it, etc. I wanted to get a few herb plants also, so we went to the herb section where Emma tasted almost all of them. She did not want to taste the chives, because it looks like grass, but after I made her, she kept asking if she could have more. I knew she would love it. We ended up with Basil, Chives, and Cilantro. 3 herbs that I use the most. I wanted to get some Mint as well, however, here must be a huge Mint (or perhaps a Mojito) “following” here because they are always sold out! Here are two of the barrels planted. (That’s one nice thing about living in the heart of wine country, there is never a shortage of wine barrels to use for planters.) Notice the pretty ornamental grass in the middle….that the cat promptly nibbled on that evening, so now half of it is shorter than the other half. Yeah, NOT happy about that. Sunday was my get everything else done day. My goal was to get some things re-arranged in the garage, and do a little re-organizing. It felt soooo good to get so much done. 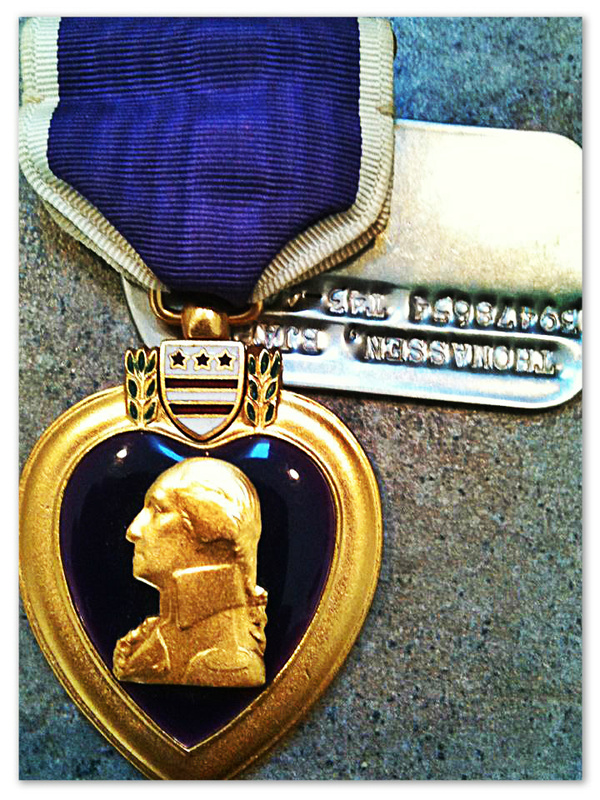 The bonus….I found my Grandpa’s purple heart medal, and dog tag from when he was in the service during WWII. I also came across some another medal of his (I need to research to find out its significance), some old ration booklets, and some other WWII memorabilia that my Grandma had passed down to me before she passed away. Fun, Kelly! We snuck in a boat ride(not ours, Gary’s) and a swim meet, oh, and a glass of wine in the newly mown back yard.